I was dragged kicking and screaming to a Transition Town Workshop in late 2008. I was convinced there was nothing for me to learn there about community development (and terrified of showing everybody how little I knew about Peak Oil and climate change.) Yet since then I have been totally hooked on working with the model in my own community and as a trainer for Transition Workshops across Canada. What is it that keeps me enthralled two years later? It is simply one of the most compelling approaches to community change and engagement that I have ever worked with. On one level, the Transition Town model is so simple and direct. Life with less fossil fuel is inevitable and could actually be a good thing. It could lead to a healthier, better world. So let's get started - now - in our communities, households and our businesses. On another level, the model poses a staggering challenge. It invites us to reinvent our relationships with (or beliefs about) our natural and built environments, our neighbours, and ultimately with ourselves as we start to walk a pathway toward greater resilience. The model is based on what co-founder and author Rob Hopkins calls the 12 Steps. As the name suggests, the idea is to understand fossil fuels as an addiction to overcome, bit by bit. It places great confidence in ordinary people as the solution, not as the problem, and presents the future as a welcoming place, not a forbidding one. It meets people where they are. Last of all, the founders of the Transition Town model have generously and wisely "let it go." While all Transition Towns share the same core principles, the unique context of each city, town, or neighbourhood changes the way these principles are acted out and strengthened. It is a grand social experiment and it seems to be working. Now, five years since Totnes, England started their process, there are nearly 500 Transition Towns in the world. It has gone viral! Form an initiating group and design its demise. Raise awareness of the issues. Hold a celebration (a "great unleashing") to announce the launch of the initiative. Form working groups (food, waste, energy, education, youth, economics, and so on). Representatives of the working groups form a "core" or permanent group. Create an Energy Descent Action Plan for the community/region. Involve everyone. Elders, youth, and ethnic groups have a great deal to offer transition efforts. "Open Space" is a great way to help participants to create their own agendas and take initiative. Network and create partnerships and alliances with government and other organizations and groups. Build bridges around common purpose. Develop and encourage a positive vision of the future. Make it visible. Do things! Learning (or re-learning) skills in food processing, bike repair, or gardening all increase our self-reliance. Pay attention to and assist people's inner transition as well as their outer (visible) transition. Let it go where it wants! The 2-day Training for Transition Workshop introduces all these steps and lets participants work with them. It can prepare people in your community to give leadership to Transition - one way or another. You might say that the purpose of Transition Towns is to build a community's awareness, knowledge, engagement, relationships, and tools such that it can complete and carry out an Energy Descent Action Plan (EDAP). Find out about the Transition Totnes EDAP and the exciting process they used to compose it. Michelle Colussi is a certified facilitator of the Training for Transition Workshop, and a member of Transition Victoria. She is also a member of the Canadian CED Network (CCEDNet). i4 is an ejournal about Inspiring, Innovating, Inciting, and Inventing ways of life and work that permit humanity and the planet to thrive in this century of unprecedented challenges. i4 is a publication of the Canadian Centre for Community Renewal. 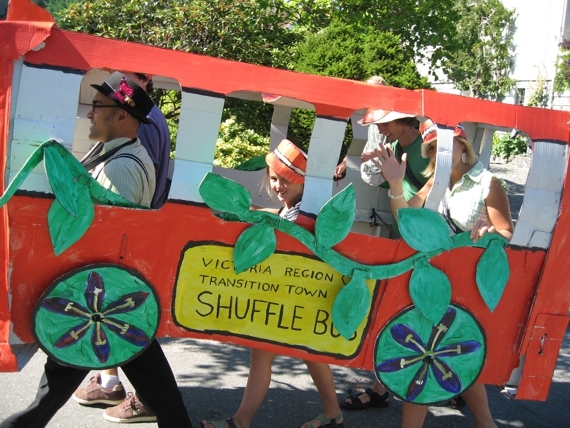 Photo (top): The Transition Shuffle Bus goes to the South Jubilee Street Fest in Victoria in September 2009. Courtesy of Ken Leslie. 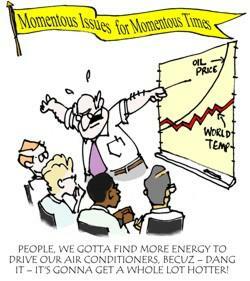 Cartoon: Don McNair, Canadian Centre for Community Renewal.